I like spaghetti squash. It’s a great alternative to traditional pasta, and you can flavor it so many ways. 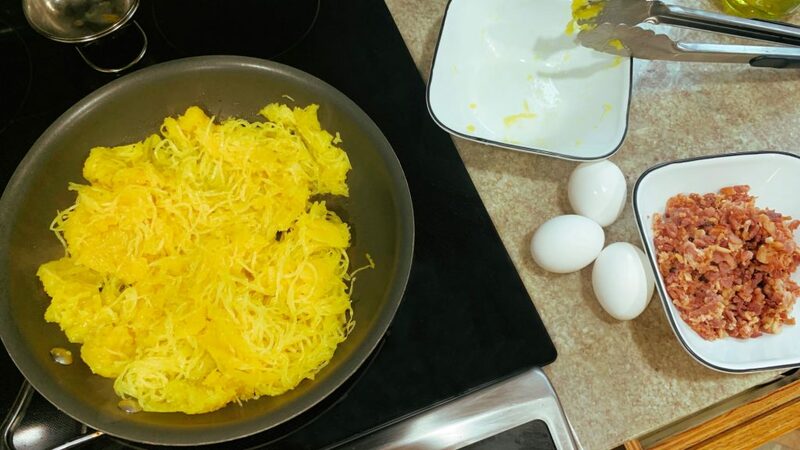 Spaghetti squash is easy to roast in the oven or pressure cook in an Instant Pot. I usually cook up a large squash so I can save the extras in the fridge for quick and easy lunches. It’s an quick way to do some meal prepping. Top the squash with some marinara and meat sauce or chicken and pesto, and you have a tasty meal. 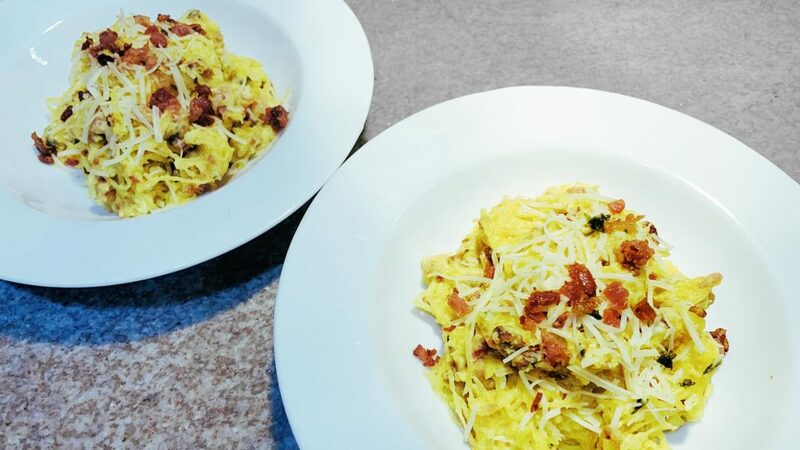 Pasta carbonara is a classic dish that feels like a splurge at any Italian restaurant, but it’s really easy to make at home. 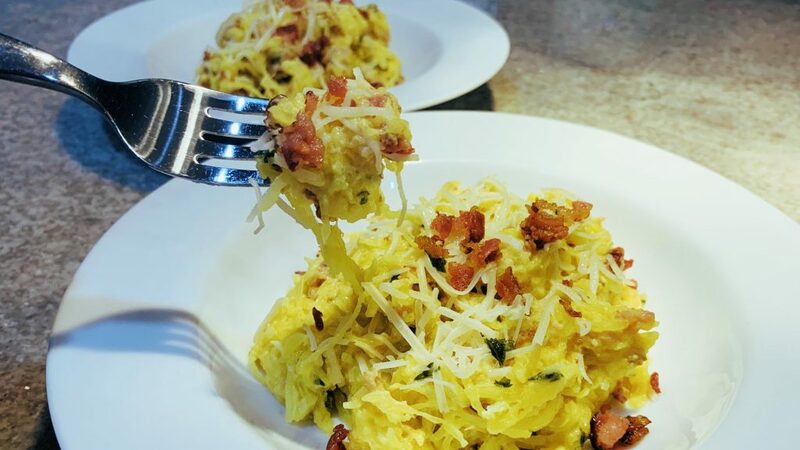 And, when you use spaghetti squash, it tastes like an indulgence without any regrets. My husband was able to come home for lunch one day, and I made this for him. He thought it was really special, and it only took a few minutes to cook up. 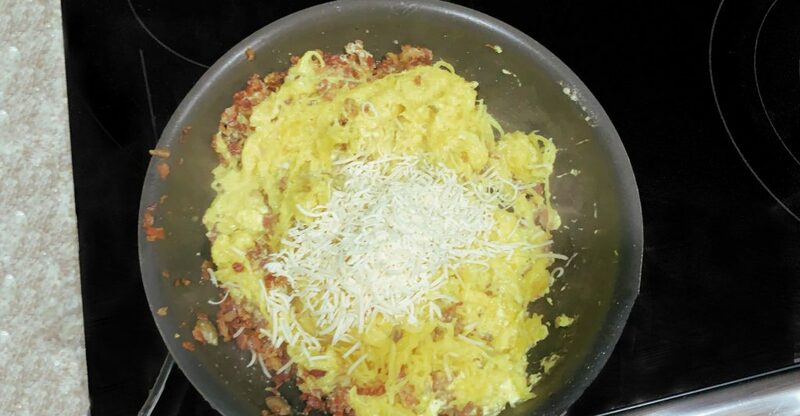 Start by warming up the spaghetti squash in a frying pan over medium heat. I used two cups of squash for the two of us, but this recipe recipe is easy to halve if you’re only cooking for one. While the squash is warming up, whisk together heavy cream and egg yolks, this becomes the luscious sauce. After the squash is heated through, put it in a bowl for later. Add bacon crumbles to the same pan and crisp them up. Once the bacon crumbles are crispy and fragrant, add crushed garlic to the pan. Cook the garlic briefly until it’s fragrant, and then add the spaghetti squash back to the pan. 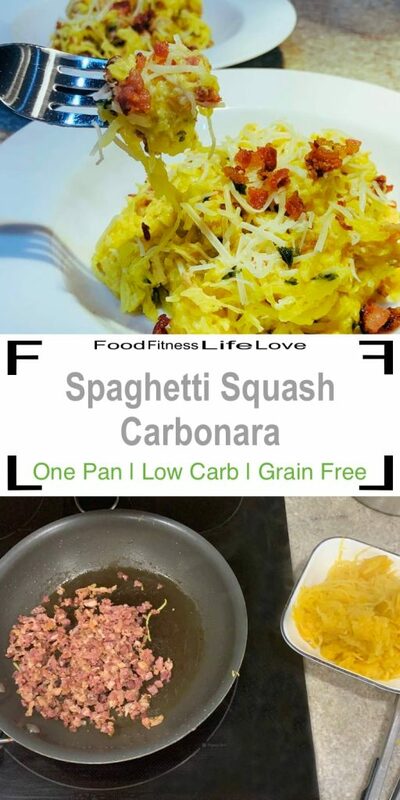 Toss the squash with the bacon and garlic to get everything evenly mixed. Then, pour in the egg yolk mixture, while continuously tossing with tongs. This prevents the egg from scrambling and coats all the spaghetti squash with sauce. 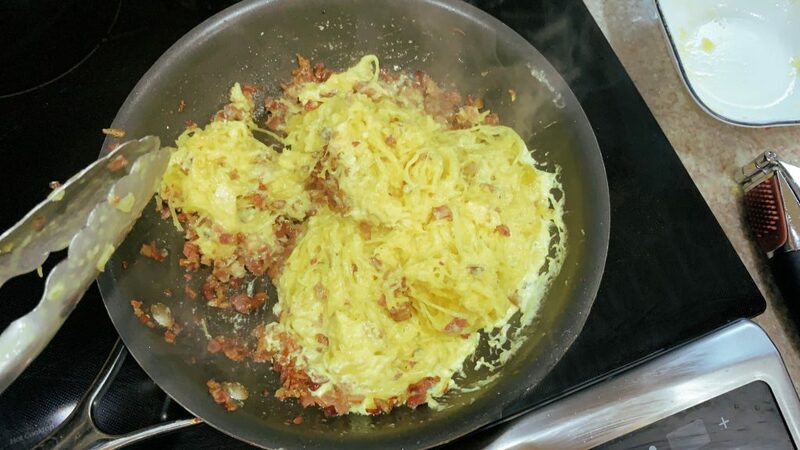 After a minute of tossing the Spaghetti Squash Carbonara, remove the pan from the heat. Finally, add parmesan cheese to the pan and toss some more. And that’s it. Just a couple minutes and you have a quick and delicious lunch all in one pan. Or a tasty dinner for the whole family, just double the recipe as needed. Heat a skillet on the stove over medium heat. Add the olive oil and spaghetti squash. Stir the squash until warmed through, about 5 minutes. 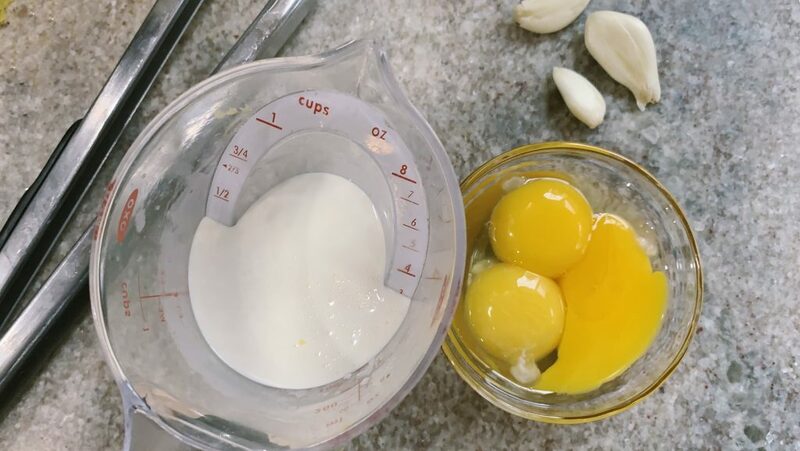 While the squash is warming, whisk the heavy cream and egg yolks together and set aside. Once the squash is warmed up, remove it from the pan and set aside. Add the bacon crumbles to the pan and cook until crispy and fragrant, about 3 minutes. Stir in the crushed garlic and cook until fragrant, careful not to let it burn. 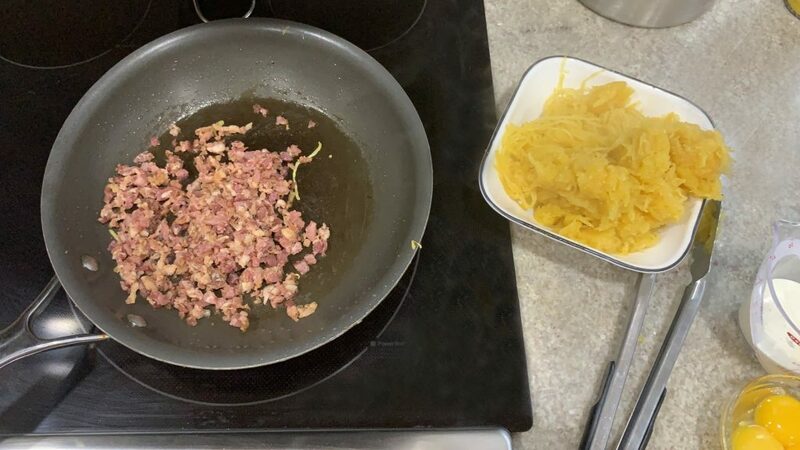 When the garlic is fragrant, add the squash back to the pan and toss with the garlic and bacon. Pour the egg mixture over the squash mixture. Toss for another minute to coat the spaghetti squash, and then remove from the heat. Add the parmesan cheese and parsley flakes and continue tossing until throughly mixed. Serve and enjoy.